What's the difference between culottes and palazzo pants? Length? (Obviously). Is there more? I don't have inspiration pics for all of these, but where I do have them, I'll paste them in. #1 Culottes with tonal flowy shirt. #2-3 Same flowy shirt with palazzo pants. (I rather like this, and think it might work for a dressy event). 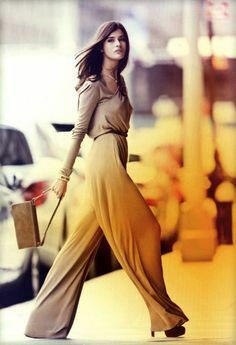 #4 inspiration pic for tonal wide pants with flowy shirt. #5 another, not so successful, attempt at something like the inspiration pic. #6 Palazzo pants with boxy, flowy top. #7 inspiration pic for #6. These are all intended to look at least sort of 70s, for the era challenge, but I think I'd wear several of them as-is now. And I'm going to be reading Angie's suggestions for culottes over and over, because I really enjoy wearing these! I love your #2 for right now. But boy nothing says '70s to me like culottes. I was embarrassed by them in the '70's btw. I was scandalised by pants for girls and my mum was all feminist on me... ahahaha! I feel... haha... the difference between culottes and palazzos is... rayon. Now rayon, nothing's says '90s to me like rayon. Lol. I make myself laugh. Ooooh. I'm liking the look of #5 because cobalt is dazzling on you, Amy. Fun with black. I can't see much of the all black outfits unfortunately, but the culottes look like winners. Fab top and bottom proportions in #1. Black culottes look very promising! (Agree with Angie that it's hard to see all black on the photo). And shoes look like fun. Yeah - sorry that photos are awfully black! Let me see if I can lighten them up. It rained outside all day today, and lazy as I am, I didn't want to go outside to take pictures in the rain even for better light. I really love the culottes on you. They look quite "flowy" -- is that correct? I think you can wear them brilliantly. Yes - the culottes in #1 are quite flowy. I'll be wearing them more, as they're very practical and fit well :) Hopefully they'll render better in pictures on not-quite-so-dismal days. Love #8! No they are not too big, they look perfect to me. I like the flowy culottes in #1 as well. Not as big a fan of the palazzo pants, but probably because they read better in movement. #6 is my favorite among the palazzo looks because the bare arms help break up the expanse of dark color. Love both culottes on you. With the first one, I would also try a lighter shoe and/or a bit of a heel. I know I am a flats person but with culottes a bit of heel seems to make a big difference. The others are just to dark to appreciate properly (it is hard to even see they are pants) but I love the concept. You've done a great job with the culottes and flowy pants! I love 1 and 8. The other photos are hard to make out, but I can see from your inspiration photos that you've achieved the character, even if I can't make out the details. (Black is sooo hard to photograph--don't feel bad about it.) I also think these drapey pants are about the hardest thing to capture in photos, regardless of color. You need one of those wind machines they've used in the models' pics!